Diabetes is an exploding epidemic and the biggest challenge confronting Australia’s health system. Around 1.7 million Australians have diabetes, with 280 Australians developing the disease every day. This makes it the fastest growing chronic condition in the country. In 2013, diabetes caused 5.1 million deaths globally. 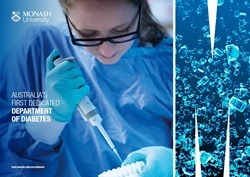 Monash University’s Department of Diabetes has more than 60 scientists and students. It is the first and only university department in Australia specifically focusing on diabetes and its complications. Established in early 2017, we are located within the Central Clinical School (CCS) of the Faculty of Medicine, Nursing and Health Sciences – a leading provider of healthcare education and research in Australia. Officially opened by the Honourable Greg Hunt MP, Minister for Health in August 2017, the new Department is a partnership between Monash University and Alfred Health. Diverse strategies – from dietary intervention to new pharmacological approaches – to combat diabetes and its complications, the three most significant of which are kidney disease, heart disease and blindness. Collaborations with local, national and international research and healthcare provider partners to give us the opportunity to work closely with clinicians and patients to translate findings from the lab into clinical trials or treatments that will have tangible health benefits for people and communities. Nurture young research talent through mentoring during PhD projects - our research leaders have overseen 50 PhD students to completion of their projects.